Yuzuru Hanyu of Japan performs his long program at the 2016-17 ISU Grand Prix Final. Japan’s Yuzuru Hanyu won his fourth consecutive ISU Grand Prix Final with 293.90 points on the strength of his short program in Marseille, France. USA’s Nathan Chen (282.85) edged out Japan’s Shoma Uno (282.51) for silver. 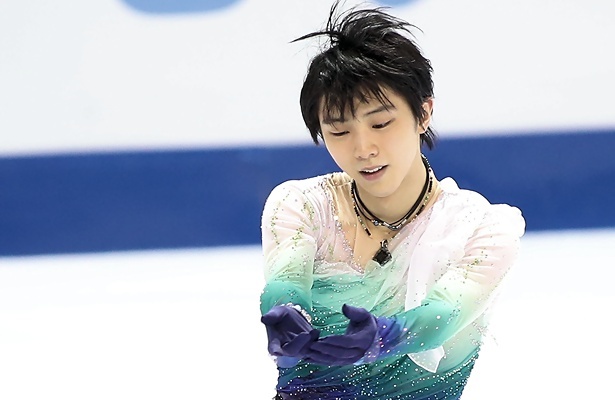 Hanyu was last to skate in the short program on Thursday and his routine to “Let’s Go Crazy” was one of the highlights of the day. The student of Brian Order landed a nearly clean quad loop, nailed a quad Salchow-triple toe loop combination and triple Axel, picking up a level four for all his non-jumping elements along the way. The 2016 Olympic champion truly set the audience on fire with his performance. His long program to “Hope and Legacy” by Joe Hisaishi was another story, however. The 22-year-old started strong with perfectly clean quad loop, followed by an equally flawless quad Salchow, but then fell on the second quad Salchow attempt, had an unsecure landing on a quad toe loop, and popped his final triple Lutz into a single. He was only third in the long program, but his advantage after the short program allowed him to defend his title. Chen pulled up from the fifth place after the short program to win a silver thanks to his outstanding performance to “Prince Igor,” which was the best of the night on Saturday. The student of Rafael Arutyunyan did not put a foot wrong in the entire routine, nailing a quad Lutz, quad flip, two quad toe loops, and a triple Axel. Artistically, the Grand Prix Final debutant was not on the same level as most of the field, but his outstanding technical proficiency earned him a stunning 113.13 points for the Total Elements Score, allowing him to win the first medal at a major senior competition in his career. “The competitions help you to have time to put new jumps in and get used to the new jumps, so that’s good for me,” the 17-year-old said about his season so far. “To have the opportunity to compete at all these events is great as I get the opportunity to put those two big jumps out there. The first half of the season has been pretty packed. I’ve had a competition pretty much every weekend, so it’s been good to have a competition and then really quick recover for the next one. That is something I can carry on for the next half of the season. “I need to make sure I’m healthy for the whole season,” Chen summed up, adding that his next step is to attack nationals. Uno opened the event with an electrifying performance to “Buenos Aires Hora Cero” and “Balada para un loco” by Astor Piazzolla, landing a quad flip and two quad toe loops. However, he did not add a triple toe loop to the triple Axel, which he nailed exactly on the music accent, and ended up having only two combination jumps out of the allowed three. This oversight cost the student of Machiko Yamada and Mihoko Higuchi a silver medal. The mistake he refers to was a painful looking fall on a downgraded quad toe-loop attempt, but fortunately, the skater who limped off the ice after the program, looked fully recovered at the time for the long. Two time World champion Javier Fernandez of Spain had to settle for the fourth place in Marseille. The student of Brian Orser missed a quad Salchow and triple Axel in both the short and the long program. He earned 268.77 total, a good twenty points below the medalists. Canada’s Patrick Chan slipped from second to fifth place after an error-ridden performance which had a total of four deductions. The student of Marina Zueva fell on his opening quad toe loop and the subsequent triple Axel, recovered to land a quad Salchow, but fell on the second triple Axel as well. He earned 266.75 points. The good part of this event should certainly include the flawless performance in the short program to The Beatles medley, which featured only one quad and the skater plans to keep it this way. USA’s Adam Rippon delivered a spectacular short program to “Let Me Think About It,” but struggled in the long. Without any clean quads in either programs, the U.S. champion finished sixth with 233.10 points.